Before even entereing, you will likely be amazed by the exterior of the museum. This sphere-shaped part of the museum is the planetarium completed in 2012. The inside (shown below) will make you feel as if you are in a science-fiction movie. The planetarium is the most popular part of the museum. The programs for the planetarium change each month based on current astronomical phenomena. The shows are projections on a huge spherical screen. Although the explanations are in Japanese, foreign visitors who do not understand Japanese still thoroughly enjoy the visual aspect. The museum is on seven floors, each floor has exhibitions with a different themes. Much of the muesuem's content is interactive. Visitors learn about science by partaking into experiments in labs. Labs such as this one that makes tornadoes and unleaches electrical discharges! Along with the permanant exhibitions, there are also some impressive temporary exhibitions such as this one by teamLab. That exhibition of mesmerizing projections of "dancing islands and waves" was featured in 2016-2017. For more information about the exhibitions and the Museum adimssion fees, opening hours, etc., please refer to the link below. 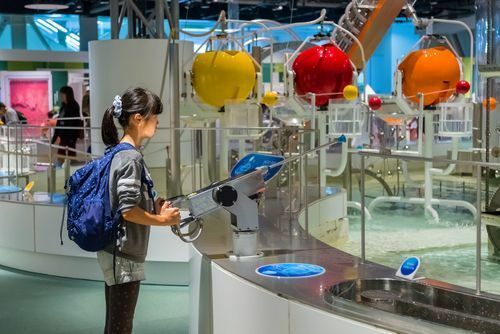 Hope you will have fun visiting the Nagoya City Science Museum! If you are exploring other parts of the city, refer to these guides to discover exceptional local foods!